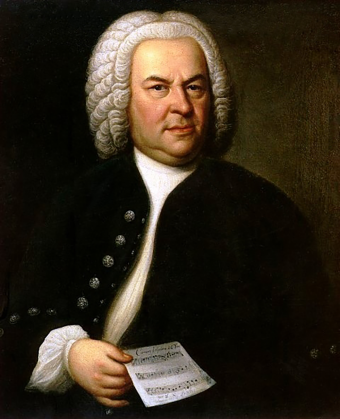 Regarded as one of the greatest composers of all time, Johann Sebastian Bach was from a family of seven generations of musicians. Beethoven considered Bach the “original father of harmony.” His influence was so encompassing that his death on July 28, 1750 marks the end of the Baroque period in music. Born in Eisenach, Germany on March 21, 1685 as the youngest of eight children, Bach was raised by an older brother after his parents died in quick succession when he was ten. Considering his familial background, it’s not surprising that young Johann showed outstanding talent as a musician and a singer, even as a very young child. In 1703, Bach landed his first job as a musician in Weimar at the court of Duke Johann Ernst. There he served very ably as a violinist and an organist. At the same time, he was gaining a reputation as a great performer and his skills quickly won him the position of organist at St. Boniface Church in Arnstadt in late 1703. During his time there, he took a leave of absence to make the 200 mile trip to Lübeck – on foot – to hear the acclaimed organist Dietrich Buxtehude play. He extended his leave from a few weeks to five months not only without permission but without notifying anyone at St. Boniface. This did not go over well with his bosses, as one would imagine. Bach went back to working for the Duke Wilhelm Ernst of Weimar from 1708- 1717. Here he had the opportunity to work with many other professional musicians and wrote some of his better compositions. He was inspired by the then-current Italian style of music, particularly Vivaldi, and made use of dramatic openings and harmonic schemes in his own works. In 1717, Bach accepted a position at the court of Prince Leopold of Anhalt-Cöthen. Duke Wilhelm Ernst was not happy about this apparently, as he held Bach hostage for several weeks before allowing him to leave. Bach composed some of his best pieces for violin during this period, as well as sonatas for multiple instruments, concertos for orchestras, and dance suites. A deeply religious man, even his secular work bore the mark of his faith as he would inscribe “INJ” (In Jesus Name) on all his sheet music. In 1721, Bach created a series of now famous orchestra concertos known as the “Brandenburg Concertos.” Unfortunately for him, the prince got married that year, and his new missus wasn’t much of a music fan. So Bach became the new organist and teacher at St. Thomas Church in Leipzig. He also served as the musical director of the other churches in town. He composed Kyrie and Gloria in 1729, which is arguably the greatest choral work in history. (Sadly, Bach never heard it performed during his lifetime.) He was subsequently appointed official court composer. Bach was losing his eyesight by 1740 but continued to work. He visited Frederick the Great, the King of Prussia, in 1747 and composed a three-part fugue for him right on the spot. By 1749, Bach’s sight was so poor he had surgery hoping to save it but instead was left completely blind. He suffered a stroke later in the year and died on July 28, 1750.